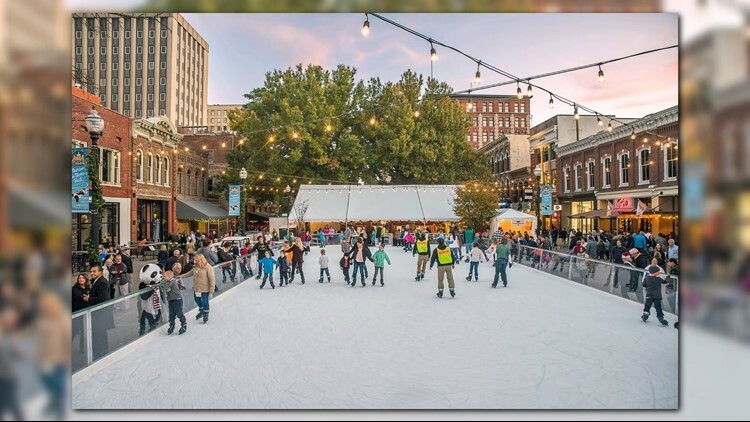 Knoxville, Tennessee — Construction for the "Holidays on Ice' rink is underway in Market Square. The downtown holiday attraction is located in front of the Knoxville Chamber at 17 Market Square in Downtown Knoxville. The skating rink opens the day after Thanksgiving and closes on Jan. 6, 2019. Special events include special skates with the Knoxville Ice Bears, or nights with the Holidays on Ice mascot Peppermint Panda. Weekly discounts are available on select nights as well. Daily admission is $11 for adults, or $8 for children 12 and under. Season passes for adults are available for $50, or $35 for children 12 and under. Mondays: Skate with hockey players from the Knoxville Ice Bears and their mascot Chilly Bear. Skaters receive $2 off admission with an Ice Bears ticket stub. Skaters who wear red & white / peppermint attire get $1 off admission. Skaters wearing Christmas sweaters and sweatshirts receive $1 off admission, and the most festive skater will win a prize! Skaters get $2 off admission with a college ID. Fridays and Saturdays: Get down and boogie on the ice with disco lights and retro tunes spun by Knox Vegas DJ. People wishing to skate may also fill out mandatory skate waivers and check out rink hours here. Monday through Thursday: 4 to 9 p.m.
Friday and Saturday: 10 a.m. to 10 p.m.
Sunday: 1 to 9 p.m.
*On Saturday Dec. 15, the Cool Sports Mites and Mini Mites youth ice hockey leagues will hold their Winter Classic Tournament on the ice rink, from 8 a.m. to 1 p.m. The rink will reopen for public skating 1:30 -10 p.m.
Monday through Thursday, plus Sunday: 1 to 8 p.m.
Christmas Eve: 11 a.m. to 4 p.m.
December 26: 1 to 9 p.m.
New Year’s Eve: 1 to 10 p.m.
New Year’s Day: 1 to 9 p.m.